So with the bear and bunny sent packing, we snagged a handy RIBBA picture ledge from Ikea that just so happened to be almost exactly the same width as our bedroom racing stripe. To decide on the perfect height, I had Kim sit upright in bed, and we measured an extra 4 or 5 inches from the top of her head. We came in at a 13 inch space from headboard to rail, which ensured no unecessary head bumps and bruises while not being too visually high. And because I love a story that includes a power tool, here’s a tip from me to you. When drilling into drywall, place the suction hose of your vacuum cleaner right below your mark and just watch all the time you save cleaning up all that pesky dust. Clean up is usually the swipe of a damp cloth. Can’t beat that. After the pilot holes were drilled, anchors installed and ledge up and running, we used a touch of white acrylic paint to conceal those Ikea flaws. Hey, it’s all in the details. Right? 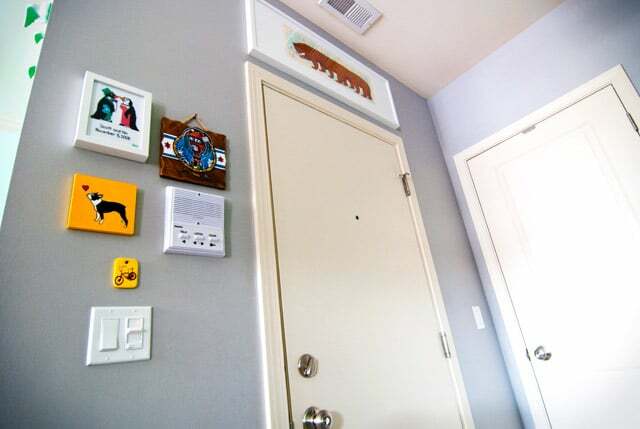 With the bear and bunny now residing over our front door, not only did the bison find a home above the bed, but the switcharoo also brought in a former hallway print. We’re so happy with how it turned out, we’re trying to remember why we ever went sans-ledge. So, what do you think? And since we’re on the topic, are you an art above the bed kind of crew, or do you prefer a mega headboard and nothing else? Or maybe a big, blank wall means sweet dreams? Let’s hear it. Love it!! We too are trying to figure out what to do right above our headboard…no luck yet. Art in the bedroom is the last thing we have to tackle and so far, we have just avoided it altogether.